This is our puppy Marley. We have never owned a Jack Russell before, but we just love him to death! He is such a great dog! He is really smart too! He is learning to sit, come, still working on stay...hahaha. He loves to go play outside and loves to play with his tennis balls, golf balls or whatever he finds outside which are: leaves, pine straw, & pine cones. He is 7 weeks in this photo, but he is getting to be 10 weeks old now. He can't even get into the harness we had on him in this photo...LOL...he is growing every day. To Anonymous in Southern Pines, NC, Thanks for the comment about Marley & thanks for the information about the golf balls. We will have to be careful with the golf balls. Thanks again. I love the pic of Marley. He is too cute and must be the jack of the month. I hope he wins. If he doesn't he will still be the best looking jack I have seen. 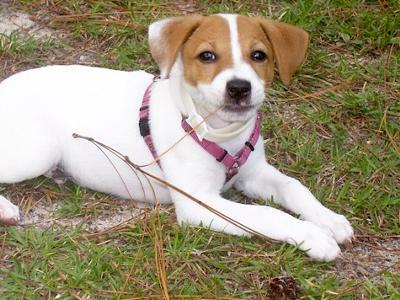 Hi, I have a Jack Russell. I have never had a dog who was so much fun. I have to caution you about golf balls. As your dog grows, you may not want him to play with small balls like golf balls for fear of having him get one caught in his throat. We live adjacent to a golf course and walk there nearly every day (except when we walk downtown) and I have taught my dog to Leave golf balls. When my Jack was a pup, he was very good about staying nearby and coming to me when I called him, but as he grew older, his hunting and running instinct took over and I have learned not to let him loose! He runs like a jack rabbit and it is very difficult to get him to return. Good luck with your Jack. They are sweet, loving, fun, and loyal pets! I live in Southern Pines, NC!